Was hosting a Christmas gathering at Spark Studios last weekend when I realised that my giant dinner table didn't really have a festive centrepiece. 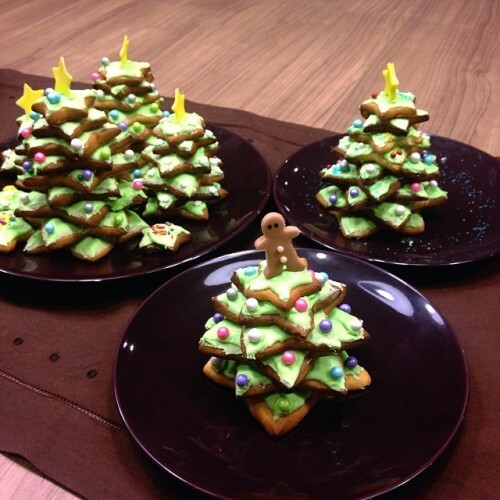 Given that I was tired from work and not in the mood to source a floral centrepiece, I decided to whip up some Christmas tree cookies per the above. Amazingly easy to do, all you need are different sized star cookie cutters and sprinkles. I created the tree toppers using fondant but other than that, it's minimal work and only a matter of baking the cookies, waiting for it too cool and spreading green royal icing on it. I used a sugar cookie recipe but you can easily substitute with gingerbread cookies to make it even more festive.